ARGENAR, Buenos Aires c.1980, producers of playing cards. The cards shown below date from around the 1980s. The courts are in the standard South American version of the Spanish Catalan pattern, with the Spanish and Argentine flags on the Ace of Coins. The four of cups has a logo and the words "Argenar" and "Industria Argentina" but no further details of this manufacturer are available. The reverse has advertising for Cymaco motor spares who have branches in Uruguay. 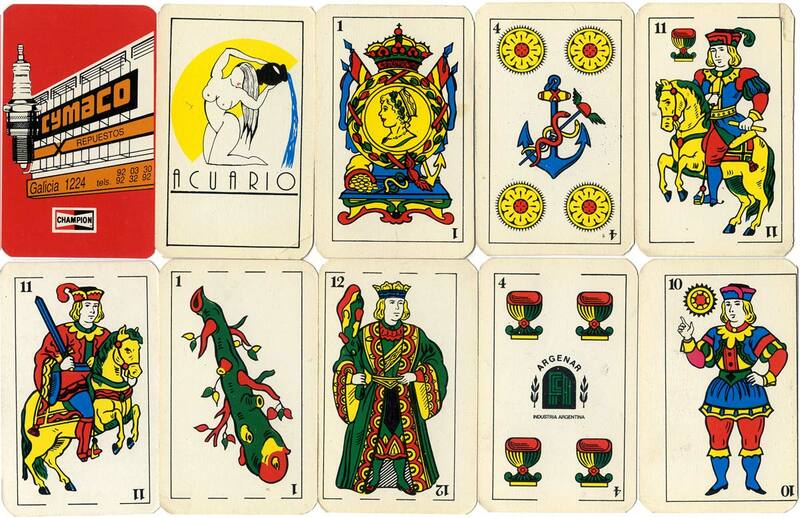 48 cards + 2 "Acuario" jokers; the courts are the standard South American version of the Catalan pattern and the ace of coins has the Argentine flag foremost. The cards are unevenly cut with roughly rounded corners. The reverse has advertising for Cymaco motor spares who have branches in Uruguay.